Completed in 1926, the schooner Adventure is a two-masted wooden sailing vessel commonly referred to as a "knockabout" type fishing schooner. Thomas McManus, the originator and leading designer of this type of schooner from the 1890s to the 1920s, designed the Adventure. It was built at the John F. James & Son shipyard in Essex, Massachusetts, a town which was the leading supplier of Atlantic fishing vessels for more than 300 years. Knockabouts were large schooners, which carried several dories and large crews, who fished thousands of baited hooks along a line anchored to the ocean bottom. As a knockabout, this schooner differs from others in the lack of the usual bowsprit and the addition of a long bow overhang, a change made to protect lives in rough waters. The vessel measures 121-feet long on the deck and 106 feet at the waterline with a 24-foot beam, and displaces 130 tons of water. The Adventure was built using traditional construction methods and materials that had prevailed in Essex for many generations. The Adventure represents the end of every aspect of the American fishing schooner era: their construction, romantic beauty, economic feasibility, mode of operation and the fishing industry in general. The Adventure fished out of Gloucester, America's oldest fishing port, from 1926-1934 and out of Boston from 1934-1953 and played a significant role in the most prosperous era of fisheries in the history of Massachusetts and the entire United States. It is one of the last three Gloucester fishing schooners built in Essex that are still afloat. The other two "Gloucestermen" are the 1925 L.A. Dunton berthed at Mystic Seaport in Mystic, Connecticut, and the 1894 Ernestina in New Bedford, Massachusetts. 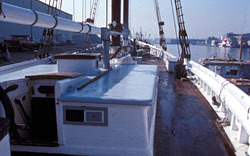 Restoration on the vessel began shortly after the Adventure was donated to the people of Gloucester in 1988. The schooner was selected as an official project of Save America's Treasures by the National Trust for Historic Preservation in 1999. The Adventure serves as a memorial to the more than 5,000 Gloucester fishermen lost at sea. 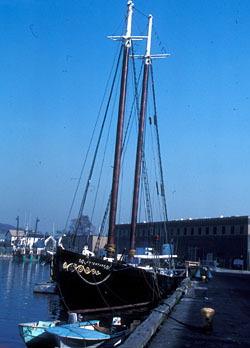 The Adventure, a National Historic Landmark, is berthed at the Gloucester Marine Railways at 81 Rocky Neck Ave in Gloucester’s Rocky Neck Art Colony. It is owned and maintained by Gloucester Adventure, Inc. Tours are generally available (May-Sept) on Saturday mornings. Please call 978-281-8079 or visit the vessel's website to obtain the most up-to-date tour and sail information.